Echo 2 was located in the village of Hoa Hiep, 12 miles north of Da Nang. Top Row: Left to right: L. Cpl. Greg Wilkins, 20, Michigan City, IN. ; Cpl. Ronald Steponik, 20, Chicago, IL. ; Cpl. Raymond Evans, 20, Reynolds, MO. ; Cpl. 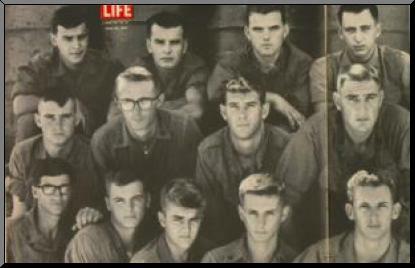 Terry Buchanan, 20, Portsmouth, VA.
Middle Row: Cpl. Mike Mullins, 20, War, WV; Sgt. John B. Large, 26, Corpus Christi, TX; Cpl. David Nielson, 26, Westbrook, ME; S/Sgt. Gary Smith, 26, San Gabriel, CA. Page 27-28: The Marines started the Combined Action Program in August of 1965, when they were trying to protect their bases from enemy harassment and mortar attack. The country around the bases was densely populated, and in order to control it the Marines stationed squads of infantrymen in the villages themselves, to provide security and win the loyalty of the people. From that point the program grew rapidly. Today CAPs are in place in 75 villages in the I Corps. A CAP has several functions. The first is to station an armed, aggressive military presence in a village, thereby keeping the V.C. honest. Over the last couple of years both Americans and the government of Vietnam have learned painfully that any pacification effort is doomed to failure unless the people are provided with physical security. Each CAP runs patrols and sets out nightly ambushes so that if the Vietcong want to enter the village to collect taxes, proselytize or terrorize, they do so at the risk of having to fight their way out again. Page 28/58A: Along the way, the Marines train the Popular Force soldiers with whom they work. A P.F.--that's what the Marines call them--is a low member of the Vietnamese military establishment; he is a soldier who serves in his own village, and is given enough time off to work his rice paddy or pursue his civilian trade. On occasion Popular Forces have fought superbly, but as a rule the P.F. is poorly paid, poorly trained, poorly motivated and sometimes--often enough to keep the Marines wary--an active agent of the enemy. The Marines' hope is that ultimately these men will be well enough trained so that the Marines can move on to a new village and the Popular Forces will carry on by themselves. The men who make up the CAPs are young, and even the team commander is a junior noncom. This is not by accident. "We don't use a gunnery sergeant--he looks like a tough old pro," explained Lt. Colonel William R. Corson, who recently returned to the U.S. after directing the Combined Action Program. "We don't use officers because the people associate them with corruption. But our young corporals and sergeants look like they have succeeded in the same way that the best of the village boys, who can only aspire to becoming corporals and sergeants, might hope to succeed." CAP Marines are chosen with care. In most cases they have had combat experience and have already spent time in the country. They are eager and 60% of them have extended their tours in Vietnam, either to get in or stay in the program. They are also chosen with an eye to their image as little ambassadors. "We've got no place for gook-haters here," Corson said. The CAP marines have some problems that don't shoot back, but they are serious ones nonetheless. The program itself is woefully short of supplies and logistical support--a situation the men remedy with sharp trading and, when necessary, downright larceny. And even when supplies are available for civic action projects, sometimes they don't get to the people because of graft and corruption among the Vietnamese officials. The CAPs do what they can to cut down on the graft, and that may include talking tough. "I know you are a crook," a CAP officer told one district chief, "but now is the time to opt for honesty and good government. If you do, I'm going to make you a hero. We are going to do things here, and you are going to get the credit. But don't cheat these people. If you do..."
The Marine made his meaning clear--either the district chief played ball or one night he was going to be bushwhacked. Page 58A: Echo 2 is located in the village of Hoa Hiep, about a dozen miles north of Danang....The men of Echo 2 believe in their program--"I feel like I'm really doing something to help the people," they will say. But this is not the Peace Corps--survival is too big a problem--and a visitor is not likely to hear many spontaneous outbursts of idealism. EchoTwo has been more successful than most CAPS, but success has not been cheap. Last November ('66) the unit was attacked and overrun by the Vietcong--who may well have had inside help from one of the Popular Force soldiers. Of the six Marines in the compound when the attack came, one was killed, and four wounded. Yet the Marines did not abandon the village. "The Marines had to show the people that they were going to fight, they were going to die--above all that they were going to stay." said Colonel Corson. The Marines of Echo Two who remained and those who came in as replacements had to make some adjustments. 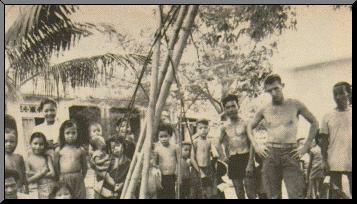 They learned not to pat Vietnamese children on the head, not to indulge in hanky-panky with the village girls. When Vietnamese invited them to share a meal they had to show gastronomical delight over such delicacies as fish heads, squid and pigs' blood. Eventually the work began to pay off. The initial hostility of the villagers gradually changed to at least apparent friendship. A few of the Popular Forces caught the spirit, and the whole platoon was amazed and delighted when one P.F., during a firefight, jumped up on a paddy dike, shouted, "Come on, V.C., I'll cut your heads off!" and took off after the enemy with his rifle blazing. The people began informing on the Vietcong. Hundreds of people each week began to show up at the dispensary run by Corpsman Robert Miller, affectionately called 'Bac si,' the Vietnamese word for doctor. Yet for all their work nothing in the village of Hoa Hiep has necessarily become safe, or easy, or predictable. Echo Two still fights its own war there. There are few pitched battles in this conflict but it is war nevertheless--a war of confinement, boredom, frustration, apprehension. It is also a war against the cunningly concealed booby trap, the single grenade thrown out of the anonymous dark, a war of the big wait--the wait for Charlie and the sudden, fast and overwhelming attack that can wipe a unit out.